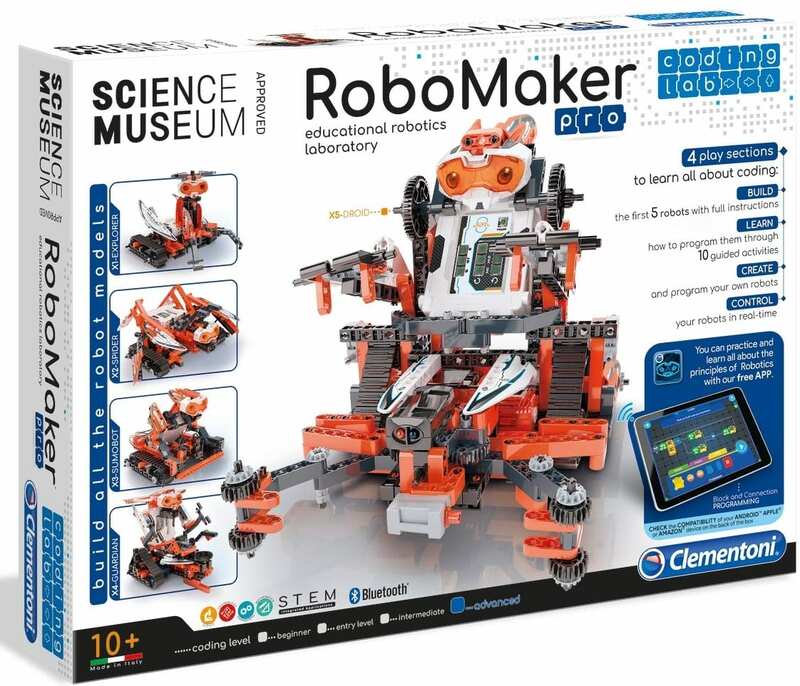 Simplify complex activities, this RoboMaker kit is designed to guide you on an educational journey to introduce you to robotics and coding. You can create 5 different robots using over 250 components. By Programming the 5 models in the order suggest, through the app or manually, your learning will progress constantly and, after completing the path, you will have acquired all the abilities required to build and programme robots of any shape by yourself!Interactive, educational, and intelligent with 4 play sections to learn all about coding — BUILD the first 5 robots with full instructions — LEARN how to program them through 10 guided activities — CREATE and program your own robots — CONTROL your robots in real-timeActivities with growing difficulty, build FIVE robots (one at a time) including the X1-EXPLORER for movements with variable speeds and duration, X2-SPIDER to free from predators and stalk the prey, X3-SUMOBOT for sumo and line following, X4-GUARDIAN to play cops and robbers or the sentinel, and the X5-ANDROID identifies and clutches objects, sorts objects according to their colorCreated with STEM Integrated Applications in mind this set promotes STEM (Science, Technology, Engineering, and Mathematics) based activities and helps in the acquisition of new skills!